Even though almost everyone I know laughs at my over-stocked kitchen cupboard, I have always known that really its supplies were barely adequate. But I had no idea just how many gaps I had in my larder until I started working with Magnus Nilssen’s Fäviken cookbook. 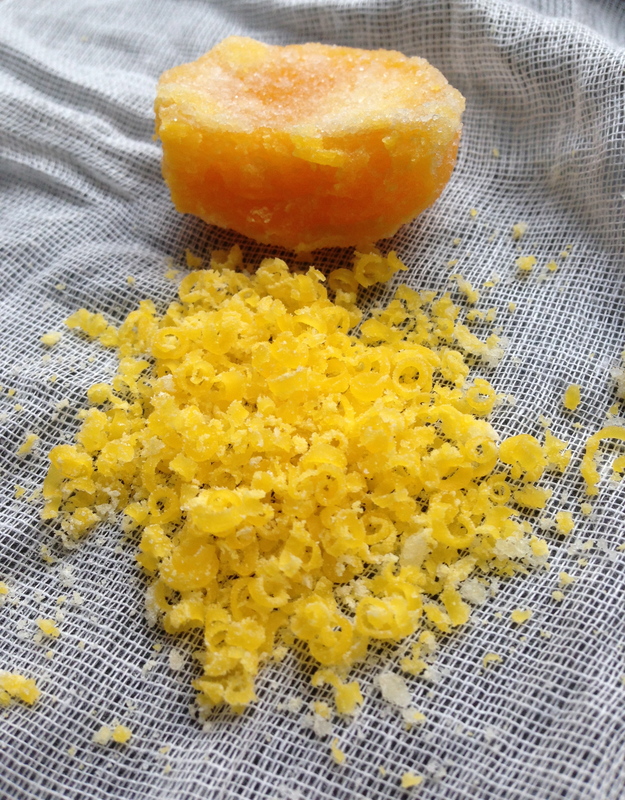 Was it really possible that not only did I have no cured egg yolk, but actually had no idea how to obtain one? It seemed absurd that such a simple item could turn out to be the elusive ingredient in a recipe involving two different kinds of lichen, but there it was. Nilsson even neglects to tell us how to prepare the yolk, a strange omission in a book that does (for example) tell us how to chop, hollow out and burn the interior of a spruce trunk in order to mature some vinegar for a year (p159). Luckily there were lots of other mentors on the internet, two kinds of egg in my fridge, and plenty of salt and sugar in the aforementioned larder. All that was needed was a bit of patience while the process unfolded over the next few weeks. I decided to record the progress of my yolks day by day, as I find it helpful to know what things I’m working on might look like both during and after the procedure. 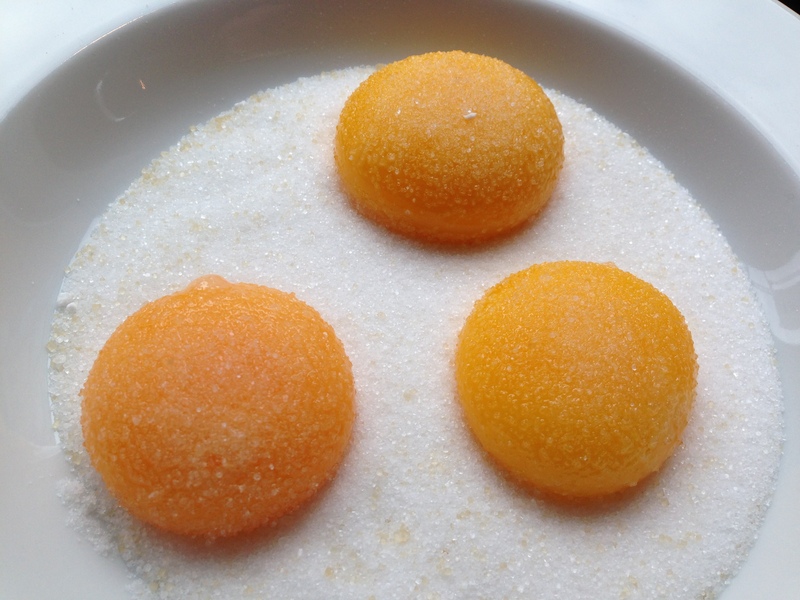 Also, the yellow globes of yolk really are quite beautiful lying in their nest of salt and sugar. This is a diary of their progress towards becoming an essential new storecupboard-staple condiment. 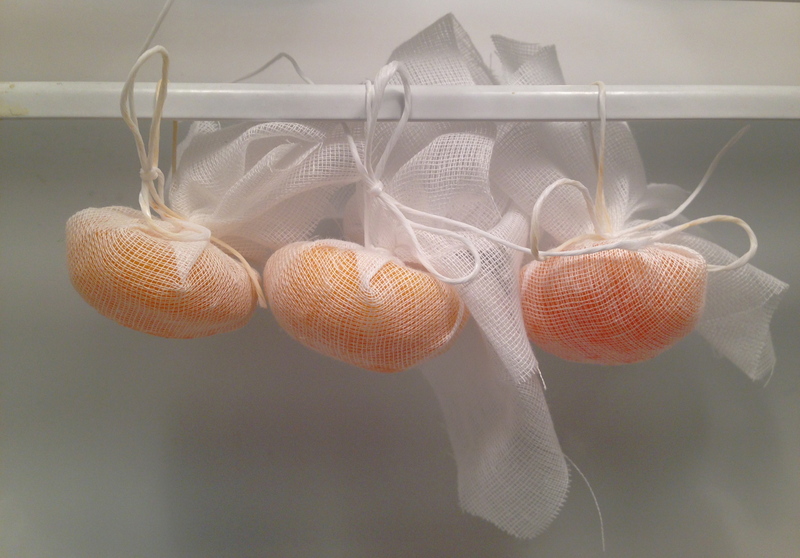 In real life, you would be able to bury the yolks and leave them alone in their curing mix until the cheesecloth stage – unless, like me, you can’t resist seeing what’s happening. Decide how many egg yolks you want to cure. 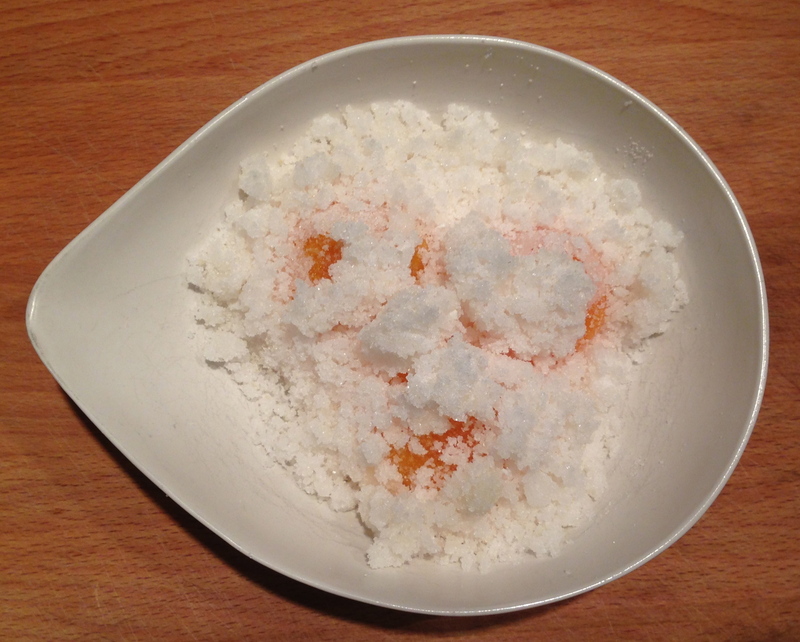 Make a 50/50 mix of fine salt and sugar, enough to surround the egg yolks in your chosen container. 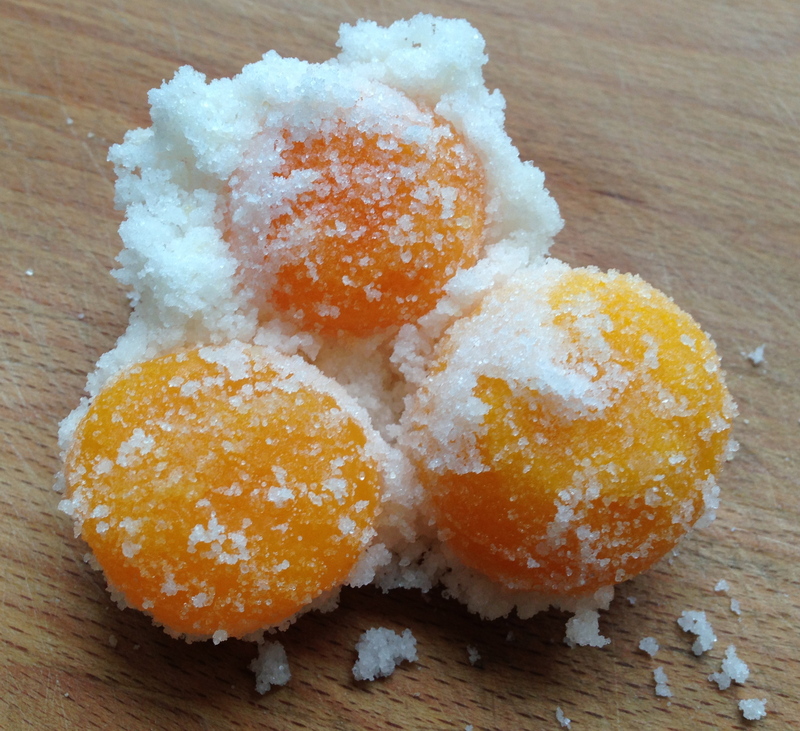 Separate the yolks from the whites, making the yolks as clean as possible without breaking them. You will have to discard any that do break, so be careful. 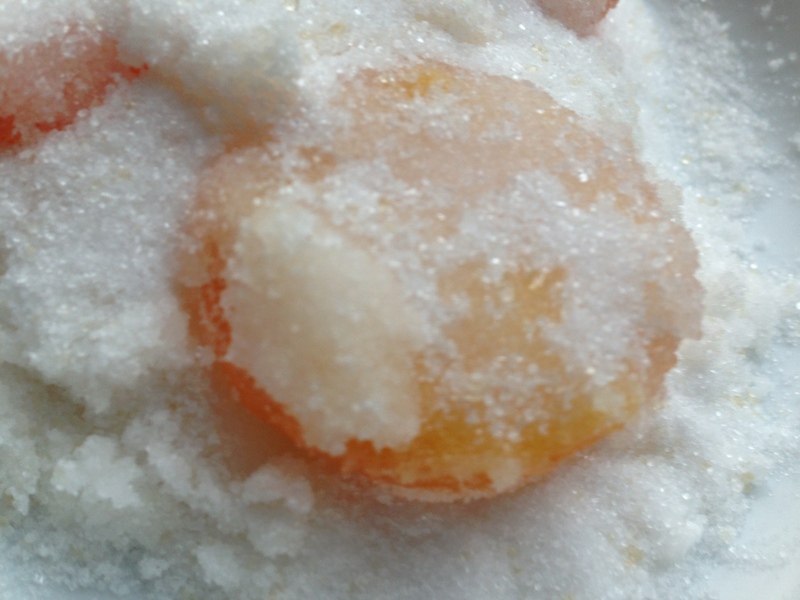 Place the yolks on a layer of salt and sugar mix, cover with some more, and put the container in the fridge. Some people advise covering, others don’t. Since a core part of the process is drying I don’t think it matters – but if you are at all worried about contamination from anything else in your fridge, cover them. yolks have already started to firm up! They look a richer orange, and are holding a definite shape. It is easy to touch them without fear of breaking them, so I can gently ruffle up the now damp -even wet – salt/sugar and turn them over. 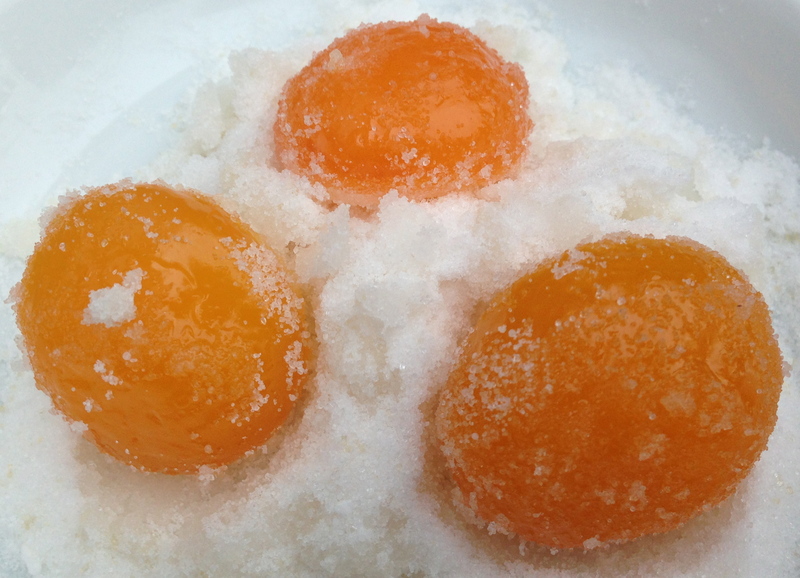 I decide to add some more salt/sugar to give the yolks a more complete covering. Then back into the fridge they go. Yesterday’s shaping theory has been proved wrong: today the yolks are exactly the same shape as yesterday. At least this means that for now, there is still one curved side. They are stiffer than they were yesterday, so it seems as though there is a good chance that they will retain this shape. I think I’ll leave them alone for a few days at a stretch, now, and see how they look next week. I’ve managed to resist disturbing my yolks for almost a week. It’s definitely time to see what they’ve been up to. Left undisturbed for a respectable interval the salt and sugar mix has set much more firmly – as hard as a rock in some places. I dug the yolks out quite cautiously, with the help of a blunt-edged teaspoon. 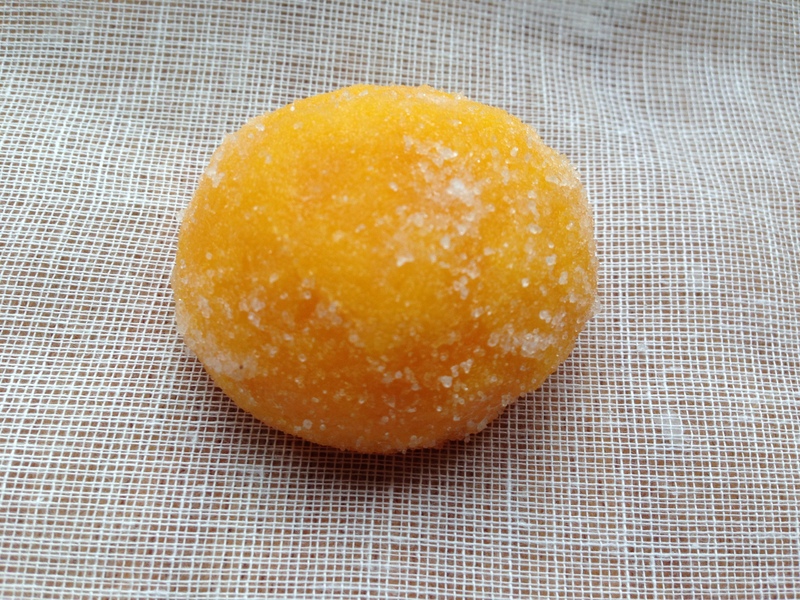 Of course, after more than a of week dry-curing the yolks are now so firm that they are almost hard – certainly tough enough to withstand some pressure, so I needn’t have worried. The main point of interest (beyond the fact that they are nearly ready for the second stage) is that the flatter side has now become concave, and those edges are noticeably paler than the centre, which is still a strong orangey-yellow. I’ve turned them once again and re-buried them for their final few days in the cure. When I take the yolks out and brush them off I can still see a little bit of stickiness in the very middle. So, although I’d originally thought of taking them out of the salt and sugar today, I reckon a little more time won’t do them any harm. In fact, one last weekend in their briny bed might do them some good. I’ll rescue them in a few days’ time. They are ready. They tear apart with some effort, and grate easily into golden curls that are delicious sprinkled on salad or used in larger quantities on pasta (think of it as a drier way of approaching carbonara – or up the cream). I have to say after this long wait that I think the end result of 50/50 salt/sugar makes something too sweet. You might prefer it that way, and some like to use more sugar, but if you are after something super-savoury (like me) I’d go for 100% salt, or 75/25. But do make some. You won’t regret finding this new staple – it might take a bit of time, but almost no effort, and the result is a gastronomic treat. Hey there, very nice instructions and detailed pictures. I can’t wait to try this out myself. I have one question though: Can I also just keep the yolks in the salt for, let’s say, three weeks, rinse them and eat them afterwards? Do I really need do take them out and dry them once more in muslin? Why not letting them cure in the salt mixture until ready? And how do you see they’re ready? Or is this just personal experience? You could certainly eat them without drying them further, they will just be softer at that stage so I don’t think you could grate them. Is the cured yolk oily? I took the route of oven drying my eggs in a 200F oven with a fan on. This is my first try at curing eggs. I think next time I’ll try a longer 75/25 salt/sugar ratio for a longer period of time, and definitely try hanging in the fridge to dry them. The ones I have made are never oily, partly because they aren’t heated at all. I think even 200F would warm them up enough to make a difference to the composition. Just to add. This batchJust to add, this batch I did 75-25 mix salt-sugar. I did 4 yolks last year. 50-50 mix. I rinsed them since I read it elsewhere. I just dried them off and hanged them in a gauze (practically the same as a muslin) and they turned out fine. I believe that today is the last curing day off my new batch. Ten I will hang them and hopefully they will turn out fine. This time I will not rinse them though! I will let you know If I remember after the drying process. Great to know – if they dry well after rinsing you’re right, there is no reason they shouldn’t be fine. It’ll be really interesting to hear what you think of the difference. Also I’d love to hear what you are doing with them all. You clearly have lots of ideas for eating them as you are making them so regularly! The first batch were a sample just for fun. I ran over this cured yolk at youtube and I liked the idea. When I tried to find the process through internet it wasn’t that much of options (this is where you came in the picture :)). Like previous comments here and on different blogs with the “recipe” indicates that it’s a good and more exciting alternative to for example parmesan. Im not sure what I will use it all for. Its good it doesn’t get bad right? I suppose I will use it for a starter at work and of course on staff food. Im also interested to try the “shortcut” version like a previous comment indicates. Just because its a “shortcut”. Sometimes Im impatient. And I will see if Im more happy with the 75-50 mix. I found thw 50-50 little bit too sweet. But as we say in Sweden; “Smaken är som baken”. They do keep, but they also keep on getting harder so they become a bit more difficult to cut or grate over a long period of time. But they still taste good! I’m with you on 50/50 being a bit too sweet – I have high hopes for your 75/25 mix. It’s all a matter of taste. A rinse in cider vinegar will definitely help at that stage. It really adds a complex depth. I also smoke mine for about twenty minutes with Apple wood before the final drying process. Sounds fantastic – I’ll definitely try this with my cold smoker next time I make some! I really want to try that! when finished and ready to be used, do you store them in salt? or do you rinse them and store them in plastic containerrs in the fridge? lately a Chef said, he just cures them for like 12 to 24 hours and then just dehydrates them for a while. Have you heard of / tried this method before? Hi Mathias. I take them out of the salt and store them wrapped in muslin in the fridge, though a friend of mine just leaves them lying around in the kitchen. You could store them in a plastic box, but do not rinse them, the last thing you want to do is get them wet. 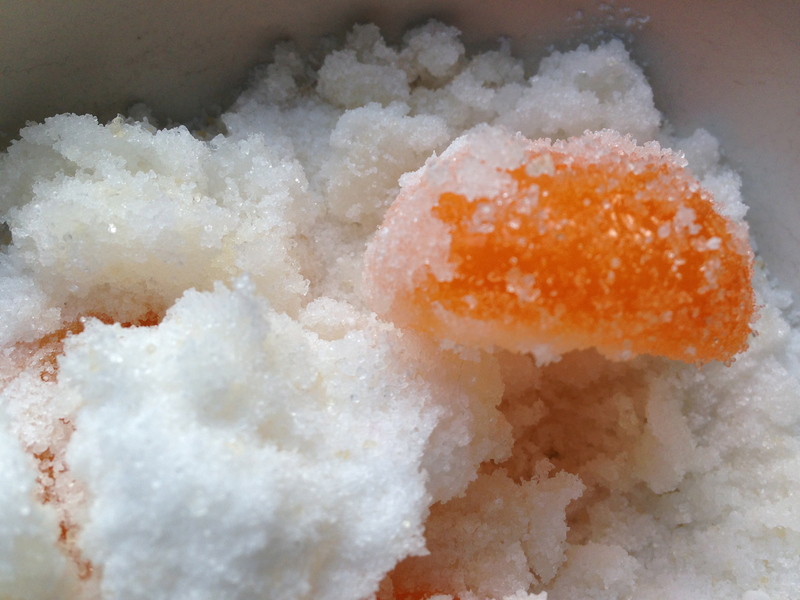 they are preserved by the salting process but if you introduce moisture they could go bad. I don’t have a dehydrated but I can imagibne that the technique you describe there would work well – the result would probably be less salty too. I hope it goes well – enjoy! I used 1 3/4 c kosher salt and 1 1/4 c granulated sugar for 5 days in the fridge and then 2 hours in a warm oven (about 200 degreees) and the consistency was perfect, but they were WAY too salty! do I change the kind of salt I’m using or the ratio of salt to sugar? Hi there, I like your oven shortcut, that is a handy hint for those of us who get tired of waiting! About the saltiness, I think it is a matter of taste and that salt is pretty much salt for this purpose – so I suggest you increase the proportion of sugar until you find the balance that is right for you. Good luck! ok I cured my eggs for three weeks, then hung them in my walk in for two weeks. they have now gained a lot of moisture and I think they are ruined; so my question is what is a muslin and what can I do to the next batch to keep them dry? Hi there – that sounds very annoying after waiting so long for them to be ready. Can you tell me a bit more about what they are like and why you think they are ruined? Are they moldy or slimy at all? If so, I think you are right and will have to start again, unfortunately. I am very surprised they would gain a lot of moisture, I have not known that to happen before – but perhaps a professional walk-in is much more damp than a domestic fridge (which is what I have). Some friends of mine keep the yolks at room temperature once they are dried, and they do need a dryer environment, so perhaps that would work better for you. The other point is that wherever you keep them, I think you are better off keeping the air circulating – I wouldn’t recommend sealing them up in plastic wrap or anything like that. Muslin is like a fine cotton gauze, so while it protects them it lets them continue to breathe. 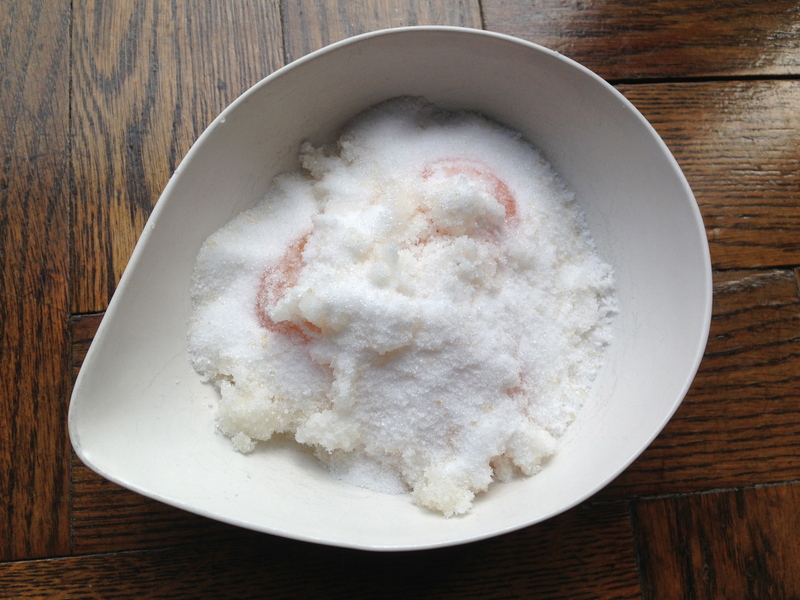 Finally, the balance of salt to sugar in your curing mix might make a difference – the more salt, the drier they will be, so a shorter curing time will matter less. What proportions did you use? I’d be happy to have a bit more info to try to get to the bottom of the problem and to make it a success next time! Started mine last night with a ration of 1 cup salt to 1/4 cup sugar. Can’t wait! Sounds great – let me know how it goes! 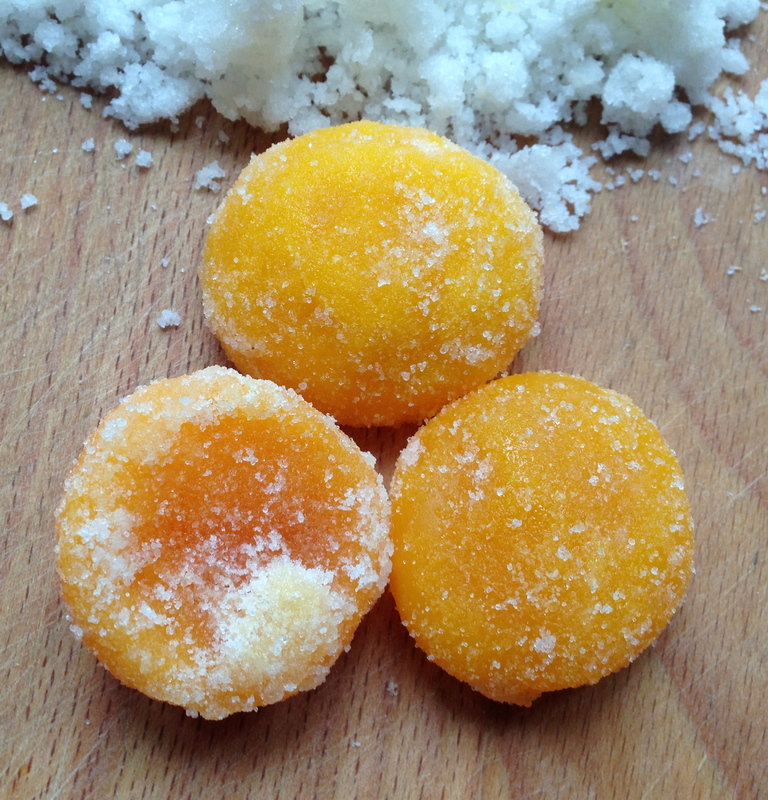 What do the cured eggs taste like? Oh, I find describing flavours quite difficult – our vocabulary is so limited, and we all have our own flavour maps in our brains, but here goes! I am not at home so I don’t have one to eat as I am doing this, so this is from memory… One of the main things is that they are very savoury, giving an intense umami feel. They are also quite intensely eggy: a strong, nutty flavour of the yolk. Then, of course, they are a bit salty-sweet, which varies depending on what proportion you used in your mixture. I think I have to ask you to make some and tell me what you think they taste like! Oh wow, they sound great – you had me at umami and savoury 🙂 I am big on cured and fermented foods right now and am going to give these a try – thank you! Great – and if you still remember after you’ve been through the process and can take a break from the deliciousness then do check back in and tell me what you think! Will do! 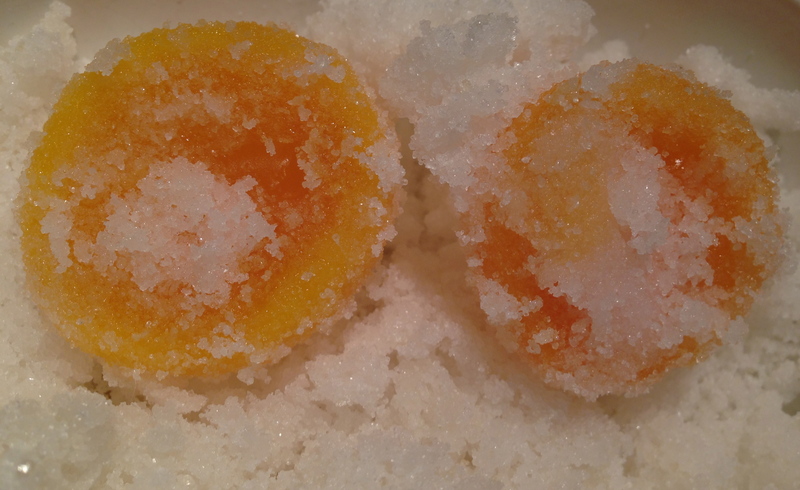 This actually reminds me a lot of bottarga, and some of the ways you suggested to use it are similar as well. Yes, they are similar uses, though the underlying flavour is definitely egg, not fish. I have also just remembered that a Chinese friend told me she uses them in congee and soups as well as other savoury dishes – I will try to gather up and try out some more ideas, and post something, maybe by the time your first batch is ready. So how is it actually safe to eat? im currently going through an apprenticeship into becoming a chef and im looking forward to trying this out as a little play around/ experiment trying out new and not to popular techniques! Hi Jade, lucky you starting on that apprenticeship. I bumped into a friend the other day who said she’d tried them, as they are similar to a Chinese ingredient she hadn’t known how to recreate – and now she makes them all the time. She puts them in soups and into rice dishes, amongst other things. Can’t wait to hear what you do with yours! Does this blog have a Facebook page? No, it doesn’t – but perhaps it should… I am finishing a huge piece of writing at the moment, and once that is done I will perhaps re-emerge out into the world again! I’m going to do this! How do you store them after they are done? Hi Robyn, I’m glad you’re going to give it a go, you won’t regret it! They keep well, because they are cured and they just keep drying out. You can keep them anywhere cool and dry – I keep mine in the fridge but I know other (maybe less fastidious) people who just leave them out somewhere cool in the kitchen or pantry. Apply the same logic as keeping a hard cheese and you’ll be fine. Let me know how it goes and which dishes you like them best in! FYI: Have you noticed the dates on the posts? It’s the 12th day of January. It’s hard to believe I wrote about that a whole year ago. I need to think of a new experiment to kick off 2014. I started day 1 this morning, saw a sidebar in Bon Appetit about grating the cured and aged yolks. Thank you for your detailed instructions. Now off to find out how to candy more yolks! I’m so glad it’s useful. Let me know how yours turn out! Nice instructions and easy to follow pics of progress. Was reading about these in a magaizine as of recent. Will try your recipie and let you know the outcome….thanks. Thanks Jack! I really look forward to hearing how it goes.